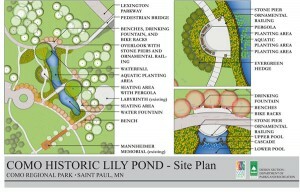 The City of Saint Paul has secured Arts and Cultural Heritage Legacy Funding to restore the Como Park Lily Pond. 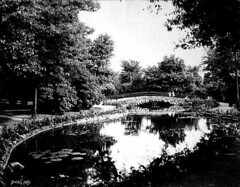 The pond last held lily pads in 1926 and has mostly been an empty concrete pond since. 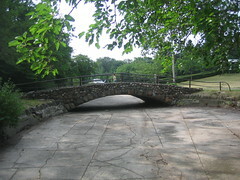 The 1903 fieldstone and concrete bridge will get some repairs and a new railing. The pond walls and bottom will be completely replaced, though it will have the same footprint and use fieldstones across the top like it currently has. The north pool will feature a water cascade and there will be a fountain in the south pool, both to help circulate water. The pond will feature native aquatic plants, so no more heating the pond and bringing in giant, exotic lily pads. There will also be a seating area north of the pond and another to the west with a pergola. No completion date has been given, but the project appears to already be underway. The Lily Pond has always been one of my favorite spaces in that grand public park. There’s an intense feeling of history there that’s hard to escape and it’s a fun place to wander around. I’m curious how that will translate with all the renovations. I’m excited that they’re doing something with the old Lily Pond, but part of me also wonders if it’ll still be the old Lily Pond. Part of its appeal was that it was empty and neglected, an odd pond with no particular use. Hopefully the restored pond will capture that sense of history that made it so great.